The middle of March brought new information about Tyrannosaurs. We start with a [paper] by Schweitzer and others in the journal Science. These authors discovered a special type of bone on the inside of a thigh bone (a femur) of a Tyrannosaurus rex. This type of bone is only found today in birds. This makes sense because birds are a type of dinosaur, the only ones to make it through the extinction at the end of the Cretaceous Period. 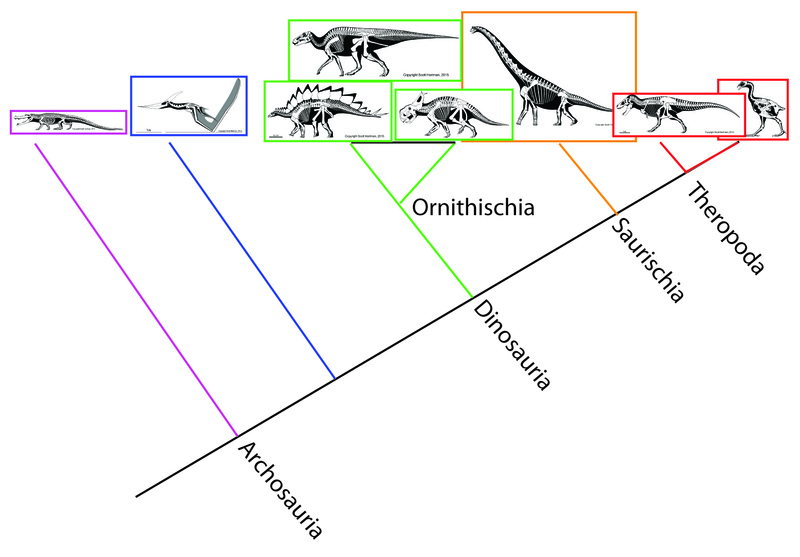 Evolutionary tree of Archosauria (crocodiles, birds, their common ancestor and all of its descendants). Birds, on the far right, are theropod dinosaurs. Drawings by Scott Hartman. This bone is super special because in birds, it’s only found in FEMALE birds that are in the process of forming or laying eggs. This type of bone is called Medullary Bone and it forms because the calcium that is needed for the mom to make eggshells is taken from her bones. Calcium is the component in eggshells that forms the outer, hard, protective layer. Figure 1 from the paper. MB is medullary bone, CB is cortical bone (the outside layer of bone), and ELB is dividing bone layer. Left is a chicken, right is Tyrannosaurus rex. This medullary bone forms to help move the calcium from the bones to the eggshells so it is only present while the eggs are being formed and laid. Once egg laying is done, the bone is almost instantly reabsorbed. This means that if we find this bone in dinosaurs, we can tell that they are female dinosaurs and that they were able to make eggs at the time they died. This gives us a whole new window into dinosaur life! 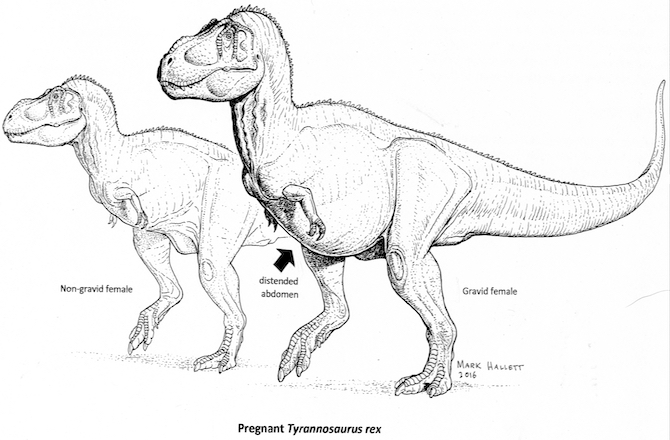 Pregnant versus not pregnant female Tyrannosaurus rex. Next, a [paper] by Brusatte and others in the journal PNAS. 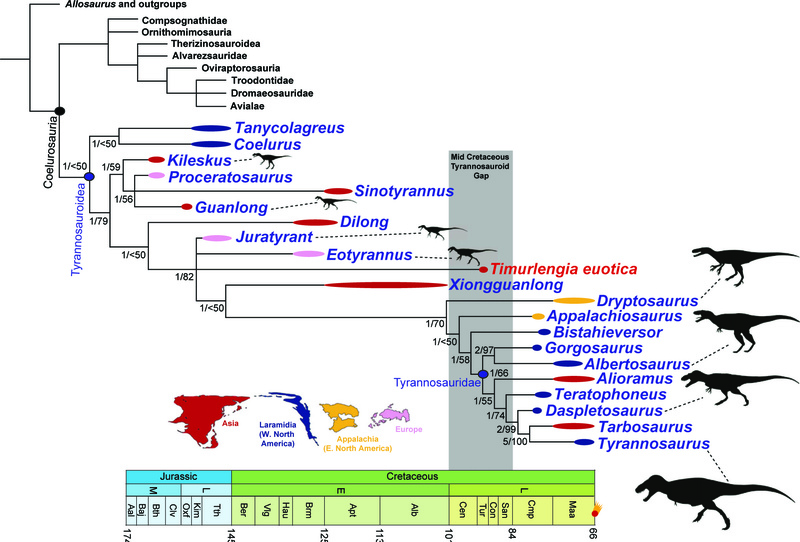 These authors describe a newly found tyrannosaur from Uzbekistan. 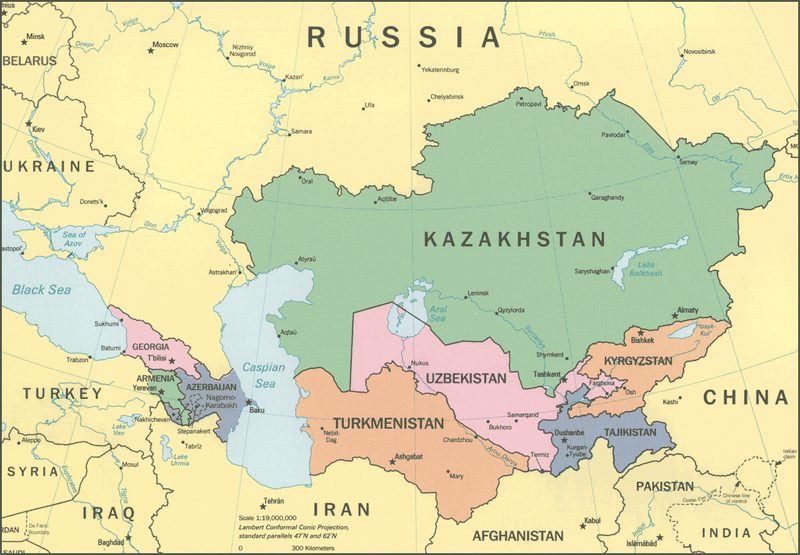 Uzbekistan is the middle pink country. This new tyrannosaur, named Timurlengia eutica, is important because it is from the early Late Cretaceous, a time that we did not have any tyrannosaurs for before. 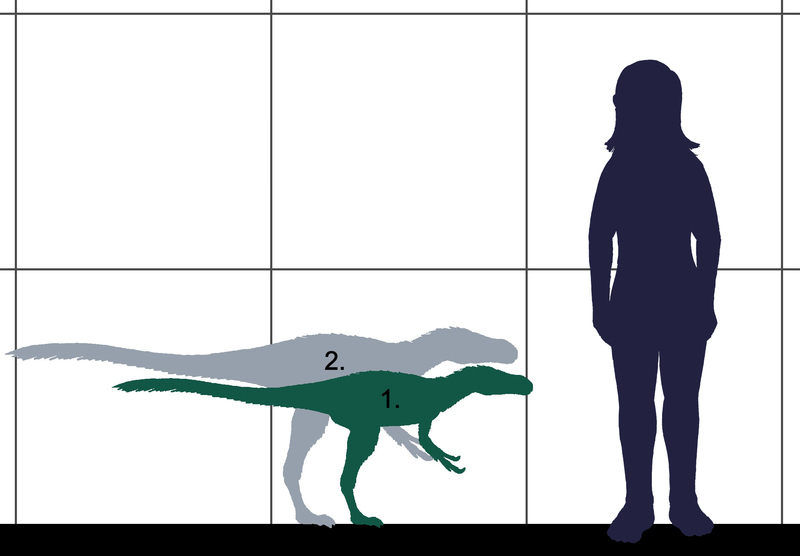 Timurlengia fills in a large time gap and can help answer questions about how quickly tyrannosaurs went from being small animals, like Dilong, to large ones, like Tyrannosaurus rex. Dilong on the left, Tyrannosaurus rex on the right. What the authors found is that this new species is still small to medium sized even though it is more closely related to the largest tyrannosaurs. This means that tyrannosaurs went from being small to medium sized animals to really big, much faster than we had thought and begins to fill in information we did not have before. Figure 3 from the paper. Tyrannosaur tree of life with the time periods on the bottom. Timurlengia is in red in the middle.